Calling all babies! The Australian Republican Movement (Queensland Branch) is running a competition for future Australian heads of state. IA history editor – and ARM Queensland branch convenor – Dr Glenn Davies reports. In New Zealand for the first time ever, the Governor-General’s 2012 New Year message will be recorded and broadcast on YouTube. In Australia we only broadcast the Queen’s Christmas message. New Year would be the right time for an Australian President to broadcast an annual message. This is something I want my children to experience. Australia is in the midst of the biggest baby boom in our history. Final figures for 2011 are expected to show the number of births topping 300,000 eclipsing the 250,000 children born at the peak of the original baby boom in 1961. The most recent ABS data says a new Aussie is born every one minute and 47 seconds. The number of births has been accelerating for a decade. The Howard government introduced the baby bonus payment in 2002 after the fertility rate hit an all-time low of 1.7 children per family in 2011. The fertility rate is now more than two. 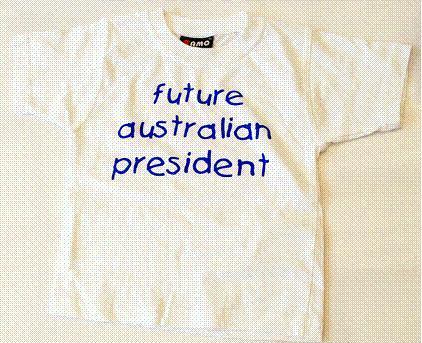 My parents have just registered me in the ‘Australia’s future president competition’. Good on ’em. This is because I was born on Australia Day - Thursday 26 January 2012. Apparently any baby born in Queensland who has their birth details forwarded to the Australian Republican Movement (Queensland branch) will receive their very first republican t-shirt and a free membership. Deep down in our hearts, we all hope one day we will not need the Queen or Charles or any other British Monarch as our Head of State any more, and we can stand on our own feet and appoint or select one of our own to be the Australian Head of State. We believe that these new Australians born on Australia Day 2012 should have the opportunity in their life time to become a future Australian president. You do not need to be a member of the Australian Republican Movement to participate.